Duolingo has got a lot of heat lately overseas. The online platform has been offering free language learning around the world for seven years. It has become possible because all courses are created in cooperation with volunteers. Luis von Ahn, the co-initiator of the project, says – During the first three years of operation we have provided 62 language courses and gained the trust of over 100 million users. Luis von Ahn: The most numerous groups are Americans, followed by Brazilians, Mexicans, French and Chinese. It changes from time to time. Poles can learn English with us now. And if someone speaks English, he can start learning Norwegian, Swedish, Esperanto, German, French or Ukrainian. The Americans learn Spanish most often. In the US more people learn a foreign language from Duolingo than at public schools. Foreigners can also learn to speak Polish from Duolingo. Our volunteers in Poland have prepared the course. In some countries, volunteer groups work on creating the course for a few weeks, in others, it lasts a bit longer. However, until now we have always been able to finish working on all of them before the end of nine months. Everyone works from a place that suits him and devotes the amount of time he wants. Indeed, we continuously monitor progress, check translations, and all the people have to work according to certain standards. We do not look for them, and they simply come to us. We have a website, which is called Duolingo Incubator, where you can submit your candidacy to Duolingo. There, our users send us proposals of cooperation. They must submit an essay, in which they explain why they are the right person to cooperate with. If someone says that he speaks Esperanto, then we are looking for another Esperanto speaker, and we verify it. So far, we have received tens of thousands of applications from volunteers. You also think about to teach less-popular languages. For me, the Tzotzil language is especially important because I come from Guatemala, where many descendants of the Mayan peoples live. We want to save from oblivion other less popular languages. We cooperate with governments and institutions which care that these languages survive. We got in touch with the Norwegian government to ask for help in developing the Norwegian course. There is quite a funny situation associated with it. At the same time, when working on the Norwegian language course, Swedish language course was also being prepared. There was a rivalry between the Norwegians and the Swedes, which resulted in some malice between the neighbours. When learning Norwegian, we can read, for example: ” the Swedes smell bad”. Some users were angry at us, because, for example, the Irish course was ready before the Russian and Chinese courses, which are much more popular. Many Irish descendants are living in the United States who have never been to Ireland. However, they identify themselves with this country. We have noticed that when St. Patrick’s Day comes, many people are actively learning Irish. Interestingly, three times more people learn Irish than live in Ireland. What is the method of learning languages at Duolingo? Each course has been divided into various parts. For example, one part is about food. Our users learn the names of fruits and vegetables, and then find out how to order dinner in a restaurant. In the beginning, only one module is unlocked. You have to do some exercises, then you get points, and just after mastering the material you can go to the next stage, where you learn the vocabulary associated with, for example, work. It’s like playing a computer game, and new worlds are slowly opening up for a student. We teach languages from the beginner’s level to at least, intermediate level on our platform. Sometimes we reach the B2 level, which means excellent language skills. We do not prepare advanced courses, because it is not our aim to teach perfectly and without a foreign accent. We want our students to be able to communicate without any problems. Duolingo poses a threat to other language courses offered on the Internet because your lessons do not cost anything. We may be a threat to paid language courses, but we are not a threat to schools. Schools provide continuity in teaching because teachers take care about a student making progress in the process of learning. When you learn a language at home, at some point you can close our website and enter Facebook. We’ve already worked with schools. Teachers around the world can use Duolingo during their lessons. We do not want our program to replace teachers but to replace the book and the text. Traditional textbooks are expensive and are not interactive. Our students solve written exercises, read, listen and repeat phrases, and then the application tells them if they did it correctly. The role of the teacher is to motivate students, help them to dispel the doubts, to show them the right context. It is all essential. Why do you give us an opportunity to learn a foreign language for free? I was raised in Guatemala, which is a developing country, but my parents belonged to an upper middle class. I went to good schools, but people who lived in my neighbourhood did not have the same opportunity. I saw the difference between the poor and the rich when it comes to education. Together with my student, Severin Hacker, we wanted to create something that no one will have to pay for, and what will help different social classes in education. We have focused on foreign languages ​​because people spend time learning them both at school and outside it. 1.2 billion people learn foreign languages ​​around the world. 800 million are learning English because they earn little on, and thus they try to escape the vicious circle of poverty. A lot depends on the country, but thanks to the knowledge of English a salary can increase by 20 per cent or even 100 per cent. However, private tutoring is expensive. In Latin America, the Open English course costs $ 1,000. It’s absurd. In practice, if someone has much money, he can pay for the best schools, and because he managed to get a good education, he will get a good job, while people who are poor can barely write and read. It is happening in many countries around the world. It is a reason why many people are not able to get a decent job and earn decent money. For me, Duolingo is terrific. For example, Bill Gates, the wealthiest man in the world is learning with us, along with those who could not afford a course. That’s what we wanted to achieve. Software costs some money. Where did you get the money for the development of the Duolingo platform? Our company has gained investors, including Google, which allocated almost half of the total amount for the project, 45 million dollars. Thereby we can work on the development of the platform, but our idea is that Duolingo will support itself in future. Many companies want to put their logo on our applications. For example, the students, while learning, will see the picture of yoghurt, and it will probably have the name of a given brand in the future. On the other hand, our users would also like to know the pronunciation of different products in a given country. For example, the Spaniards say “cola”, not Coca-Cola. Moreover, it is also worth remembering. We do not have to teach anyone the name “tequila” because the pronunciation is the same all around the world. In the beginning, your company also earned money on translations. Volunteers were translating texts into other languages for different media organisations, for example, CNN and BuzzFeed. In return, the principals transferred the remuneration to Duolingo. When we started doing it, we were doing very well, but we realised that unfortunately we began to be a translation company, and we were interested in education. We decided we didn’t want to develop further into this direction. We started issuing language certificates. All the education is free, but if someone is interested in getting the certificate, will have to pay several dozen dollars. We want our certificate to be equal to, for example, the TOEFL certificate, which is issued by Educational Testing Service. It is an organisation examining and evaluating the work of private schools, based in the United States. TOEFL is required if someone wants to study at a university in the US and costs about $ 250. Honestly, I do not know why one has to pay so much. After all, the paper you write the test on is cheap. Besides, to pass the exam, you have to go to the examination centre. It may seem simple for someone who lives in the city, but what about those who live in the countryside? When I wanted to study in the United States, I had to prove that I have a good command of English. Unfortunately, there were no more places to write a test in Guatemala, so I had to fly to El Salvador to take the test on time. I paid 250 dollars for the exam itself, plus the cost of the flight ticket and accommodation. I also spent much time organising the trip. It was ridiculous. You can pass the exam at home, via the Internet, thanks to the Duolingo Test Centre application. How can you be sure that my friend will not write the exam instead of me or that during the test I will not use dictionaries? Indeed, we want to avoid such situations. To take the exam, you need to have a webcam and a microphone, and our application records everything. One of our employees watches the recording later and checks if the exam has met our standards. A part of the fee for the certificate goes to the salary of our employee, and the rest goes to us. Thanks to this, language learning at Duolingo will still be for free. At the moment, people around the world spend 15 billion dollars annually for English language certifications. If we manage to implement our plan, we will significantly reduce their price, and I think we will help many people in this way. 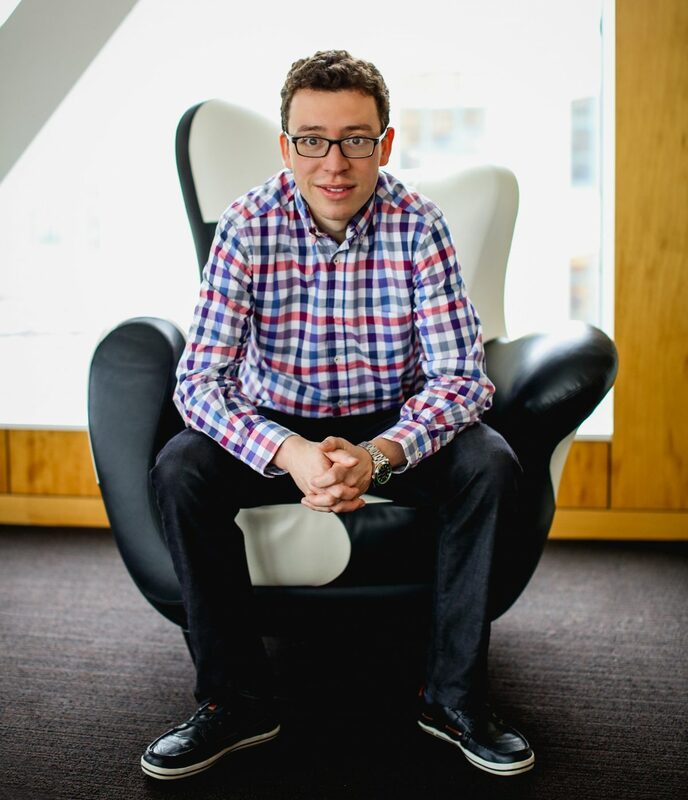 Photo: Luis von Ahn, the co-founder of Duolingo.